Dale Garraway curling at Riverfront Park. It's approaching 8 pm and about 50 people are clustered on either end of the Riverfront Park Ice Palace, most of them bundled up to fight the frigid 20-degree temperatures on this first Sunday of the new year. 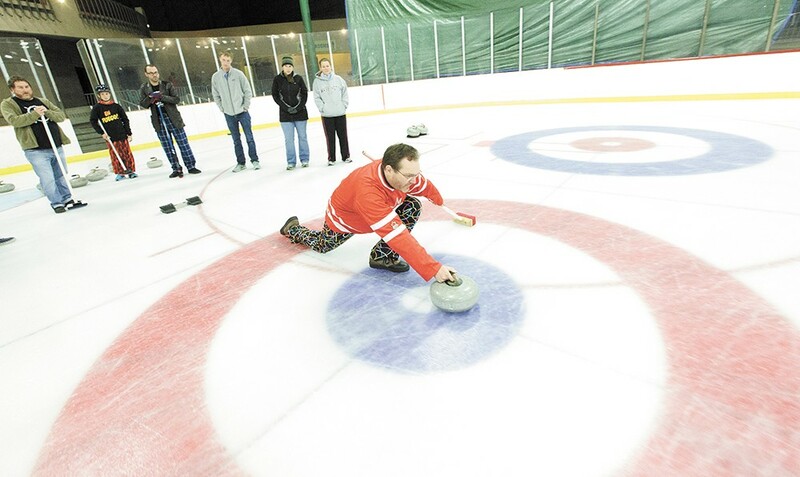 It's opening night for the Lilac City Curling Club's winter league, and neither harsh elements nor lingering hangovers will keep the die-hard curlers away from the ice. In fact, the teams are reveling in catching up after a holiday pause, some making plans to go for drinks after, and some having had a few pops before their two-hour match. Most here are relative newbies to the sport, having taken it up when the club formed four years ago after some Spokane residents — enamored with the late-night shuffleboard-on-steroids seen during the Winter Olympics every four years — decided to seek out some stones (the 44-pound tools of the trade), some brooms and an appropriate slab of ice to give curling a spin. Rick McCrickard, one of the club's founders, acts as a spokesman of sorts. He grew up in non-curling country (Virginia) but saw it on TV and "it was fascinating. Then every four years when the Olympics came around, I would try to watch." When the club started to come together, McCrickard got up to speed on the rules of the sport, to a degree. He soon realized there was more to it than what a layperson sees on TV — the attempts to stop the stones at the center of the target (the "button" in proper parlance). "There's a lot of strategy of not only getting your stone closer, but not allowing your opponent to get closer," McCrickard says. "They call it 'chess on ice.' Not at my skill level, but other people." Teams consist of four players per side, who take turns throwing two stones each in an "end," trying to deliver the "shot rock," the stone that ends up closest to the button. Consider an "end" like a baseball inning, with both competing teams taking a turn throwing eight stones. A full curling match consists of eight "ends" or two hours, whichever comes first. After tallying up the final score, it's "broomstacking" time, when the sport's tools are put aside and teams get to socializing. That socializing is a major appeal of curling on any scale, but especially with the Lilac City Curling Club. Current President Eric Thompson, on site collecting waiver forms and helping teams with their scoring and equipment, surveys the scene and says, "All these people having fun, for me that's the appeal." So it is for the members of the Palouse Stones, one of the teams competing this winter. Like the club founders, Shirley Carlson and Joanne Smieja got interested by watching curling in the Olympics. Three years after taking a now-defunct class through Spokane's Parks & Recreation department, they're regular competitors in the league. "It's surprising how fast you can become moderately mediocre," teammate Mark Hernick cracks as the women talk about curling's learning curve.